In the spirit of the Chap-Kit, I give you the Bic-Kit. It's yet another compact utility kit that lets my inner-Boy Scout come out to play. For just about any outdoor activity, I'm thinking this tiny setup could be a nice insurance policy. The first shot shows most of the required items assembled (whoops, forgot the lanyard). 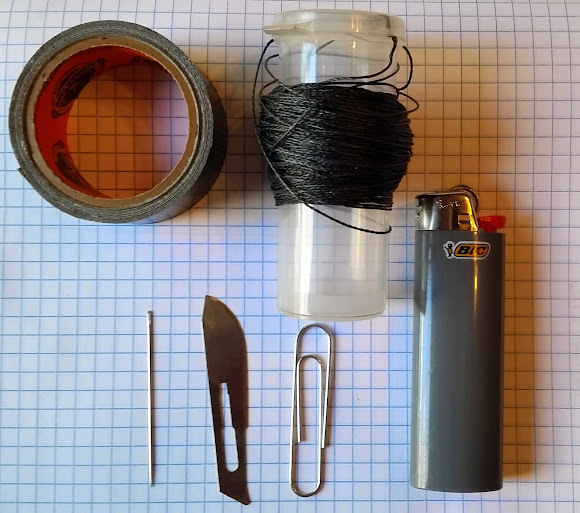 You've got a roll of Gorilla tape, some 100lb test fishing line, a needle, a #22 Scalpel blade, paper clip and of course, a Bic Lighter. Construction is obvious: tape the paper clip, blade and needle to the lighter, then wrap in fishing line. I placed a piece of paper over the blade before taping it to reduce the chance the glue from the tape would mess with the blade. The finishing touch was to attach a bright pink shoe lace to the setup as a lanyard. I had visions of attaching a black piece of paracord, but the shoelace was lying around. 30 feet of cordage. The line I used is actually pretty impressive stuff. It's quite strong and doesn't tangle easily. The only thing it probably wouldn't be good for is fishing. But, cordage, like fire and a blade, has about a million uses. Besides being compact and easily attached to a belt loop, bag strap or PFD, this kit is ready to be used immediately. 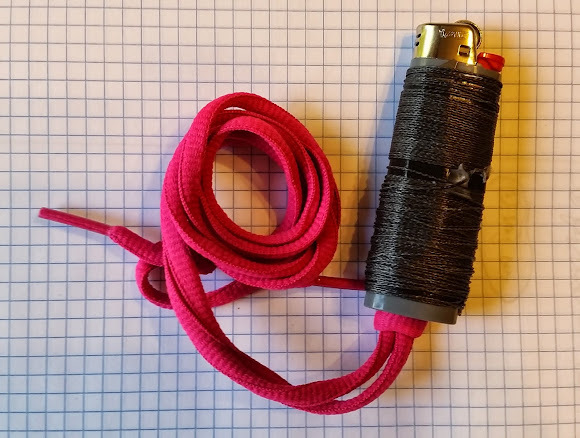 The Bic lighter works fine with the fishing cord wrapped around it, and the lanyard can be popped off easily enough to be multi-purposed. Unspooling the fishing line will is a pain, but if you want to get to the contents inside, it'll be the least of your worries. Oh, and I could probably have taped / wrapped the lighter with more items. My preference is to have a useful and compact setup with fewer high quality items, than an unwieldy setup which claims to do everything. Would I want to spend a night in the woods or be part of a SERE exercise with only a Bic-Kit on my person? No thank you. But as a last ditch kit, you could do far worse.